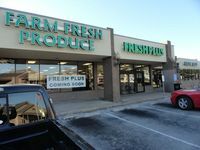 I spoke with Fresh Plus owner Paul Beurskens who said they are excited about moving into the neighborhood and are going at full speed getting everything ready for the opening this Friday, February 3.The locally-owned grocery store is taking over the space off of Anderson Lane formerly occupied by Sprouts, and before that, Sun Harvest. Sprouts closed in December due to a merger that left it with too many stores too close together. Beurskens said he was able to hire some of their former employees. Click here to read the Statesman article about the Fresh Plus annoucement of the store opening. Woo Hoo! I am so very excited and thrilled to see this turn around so quickly! I plan to be stopping in on Friday.